Chennai, 2nd September 2017: The First batch of MBA in Technopreneurship Class of 2018 by Stuart School of Business, IIT Chicago in collaboration with Great Lakes Institute of Management, Chennai commenced at the Great Lakes – ECR campus. Mr. Lakshmi Narayanan, Former Vice -Chairman – Cognizant inaugurated the program in the presence of Dr. Bala V Balachandran, Founder, Dean & Chairman, Great Lakes Institute of Management, Dr. Vaidy Jayaraman, Principal & Associate Dean, Great Lakes Institute of Management, Chennai, directors, faculty, students and other members of Great Lakes. 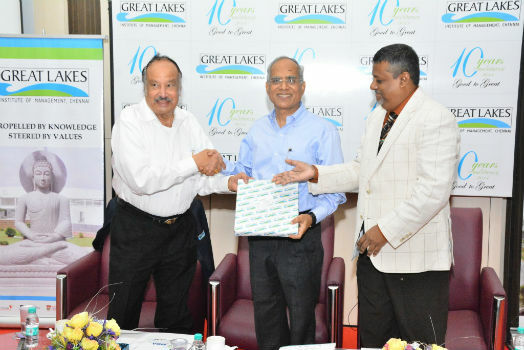 Earlier this year, in February, Great Lakes signed an MoU with Stuart School of Business – Illinois Institute of Technology, Chicago, USA and announced the launch of first of its kind 11 month blended ( a combination of residencies at Chennai, online learning, and a final residency at Chicago) MBA in Technopreneurship Program for mid-career professionals. Today, the first batch of the program consists of students with diverse background and over 5+ years’ experience have commenced this program. The program is different from the regular MBA and offers best of knowledge in design thinking, IoT, disruptive technology, cloud computing etc., and to collaborate with IIT Chicago is an additional advantage, Dr. Bala added. Inaugurating the event, Mr. Lakshmi Narayanan, Former Chairman, Cognizant, said, “ First of all hearty congratulations to everyone at Great Lakes for taking this initiative and offer a need of the hour course for entrepreneurs. When technology and entrepreneurship combines, it creates more opportunities, new products and services that will benefit the consumers and also create profit for an organization. Technology is not only limited to start-ups. Even larger firms and MNCs like GE are applying tech software to offer various opportunities. He further advised the students to develop tech skills that are required across all sectors. Be it Medical or Manufacturing, Technology is fast interrupting human life as well as getting critical in all areas of business. Develop skills, there are plenty of opportunities to change business models and produce something new and innovative. The time couldn’t be better than now, Mr. Lakshmi added. • Graduate with more than 4 years of experience, either as a professional, or in running her / his own enterprise. • Strong verifiable recommendation from subordinates, peers, and superiors. • A valid GMAT score is an added advantage, though not mandatory.